BOA president Steve Stoute (left) makes a point at the podium. At right is Erskine Simmons. 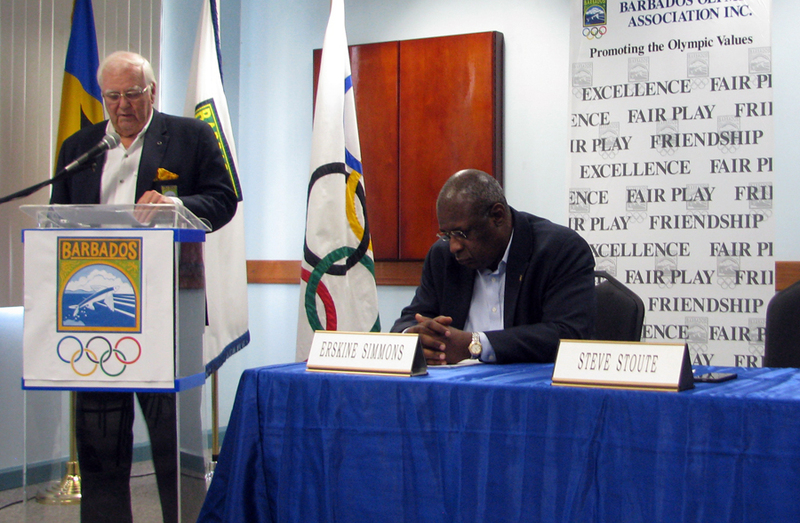 Athletes seeking funding from the Barbados Olympic Association will soon find that it will not be business as usual. At a media briefing today at the BOA’s Wildey, St. Michael head office, BOA’s secretary general Erskine Simmons said that athletes wanting to access money from the organisation would be required to sign a document committing them to participate in games specified by the BOA such as the Pan American, Commonwealth, and Central American and Caribbean Games. Adding his voice to Simmons’ comments, BOA president Steve Stoute said that when some athletes reached the “so-called elite stage”, they felt that participating in CAC, Commonwealth and Pan American Games was “below them”. But the veteran sports administrator stressed that the mentioned meets were mechanisms to help the athletes to develop and improve their reputations internationally. Stoute drew reference to some athletes who had previously been funded by the BOA and had opted out of these competitions against the wishes of the association. Stoute noted that to be involved in sports administration in Barbados at the level of the BOA could be very frustrating. “We do not have a sports culture in Barbados. Sports in the schools is a pastime,” he said.Bemoaning the fact that sports was not part of the educational curriculum, Stoute explained that students took part in sports of their own volition and the schools’ encouragement for athletes decreased after national sports ended, until the following year. “We need within the education system that sport be considered or placed on the official curriculum as occurs in many parts of the world,” Stoute said. He noted that even in the corporate world support was very little. Using former 110m hurdles world champion Ryan Brathwaite as an example, Stoute said that only when an athlete performed well did corporate Barbados step in to shower that person with accolades and financial benefits. “But these things are a little late in coming. We have to break through and change the culture,” he said, noting he had been trying to do that in his long involvement in sport but had found the situation very frustrating. Stoute once again reiterated that the efforts of the BOA had often met with resistance from some national sporting federations. He said the BOA sometimes put forward proposals but these were frequently met with misgivings from the federations. He noted that some federations liked to hear that the BOA would finance a particular situation, but they wanted full control of whatever that might be. Simmons suggested that there was a need for more synergy between the local federations and the National Sports Council. He stated that similar to what happened in other regional jurisdictions, some of the problems affecting sports were like tug-of-war among coaches and federations who believed they owned the athletes. He suggested that if one tried to suggest anything outside what was their perspective, it was akin to running into a brick wall.Simmons said the BOA had a development project on the drawing board that involved a high performance centre and he hoped that the national sports federations, Ministry of Education and Ministry of Sports would buy into it. During the briefing Simmons revealed that the BOA anticipated it would receive about US$250 000 per annum to assist in the training and preparation of teams for the Pan American, Central American and Olympic Games. “There is a special meeting of Olympic Solidarity towards the latter part of next month in St. Lucia when we hope to finalise this matter but it is our plan to use some of these funds to provide administrative support for a number of national federations who at this time are lacking in this resource. We believe that this is essential. In order to develop high quality athletes, our national federations must be functioning efficiently,” he said. Simmons said the BOA’s Allocations Commission had met with all 32-member bodies and discussed their plans, projects and programmes for 2013. He added that in many cases the BOA had agreed to increase the administration grants and also provide administrative support direct from the Barbados Olympic Centre.